It’s probably one of the questions that I get asked the most – by far. And I can understand that. Whenever is someone traveling a lot of people that are not used to that will start to think: How is he doing that? And that is understandable. Before I started to get into this area I also had no idea at all and it was, more or less, pure luck if I found a good price or not. But there are some great tricks to find cheap flights that everybody can use, even if you just travel once a year. Following I will show you how to find the cheapest flight for your trips. There are many rumors about that matter, and no one can say you how it is exactly because it depends from case to case. 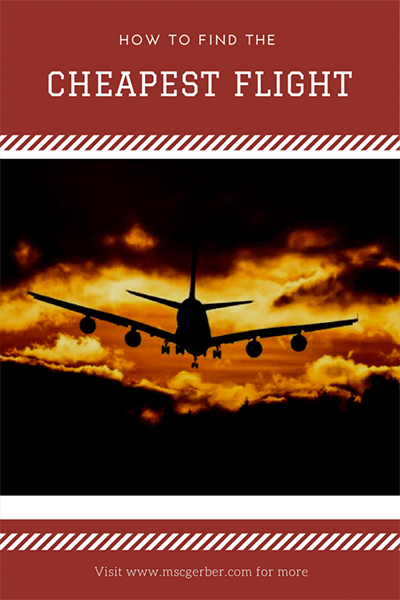 However, there are some simple rules to follow and you will know how to find the cheapest flight. CheapAir aimed to answer this question in their own study and had some pretty decent results. For domestic flights (like in the US) or flights between two countries in Europe, they recommend booking around 54 days before your trip. Again, this is just an approximate evaluation. For international flights, you should definitely book earlier, at least some months beforehand. For example, I booked my flights to Rio de Janeiro or San Diego pretty early and paid a good price, whereas the price one month before departure was 500$ higher. On the other hand, I made a late bargain to Bulgaria, where I explored many interesting areas, three weeks before departure. Additionally, you should, if possible, never book two weeks (or later) before your departure. Ticket prices will increase tremendously and will be really expensive. So just book as early as possible? No, that is not a good strategy either. Airlines always want to fill their planes, this leads to high prices at the beginning of the sale, afterward make them drop until the request gets higher again. You see, it is like in the free market economy. But how to find the cheapest flight now? One of the most important tips to find cheap flights is to track your price. I will show you that later. This is, in my opinion, the most crucial part – where you book your flight has a big impact on the price you will get at the end. Booking on the airline page itself? Not a good idea, because they just show you what they want – not what is the best for you. Many people use comparing pages like Skyscanner or Momondo. There’s nothing to say against that, I also use them from time to time, however, my favorite one is definitely Google Flights. The design is not fancy, but the options it gives you are. It is super easy to search for possible flights, you can put several starting airports, and set different filters to restrict your selection. Here an example: I choose Zurich Airport (ZRH) in Switzerland as my starting point, whereas I took both Istanbul airports in Turkey as my possible destination. This gives you more results, you are more flexible and you will get better results in general. Now you have your first search and because you did this early enough you can track the price of your flight and get a notification whenever there is a change in the price for your benefit. Once you reach a price you are happy with you can just take your chance. It is also possible to track more than one date. Once I made a decision to buy a ticket I usually head to the page of the airline and book the exact same ticket there. But be careful, sometimes it will be a bit more expensive – in that case, I would just head back and book it via the Google Flights link. This is something that came up in the last years, and I really love it. If you are not sure where to go, or you just want to get some inspiration and book spontaneously this is a good technique how to finding cheap flights with flexible dates! 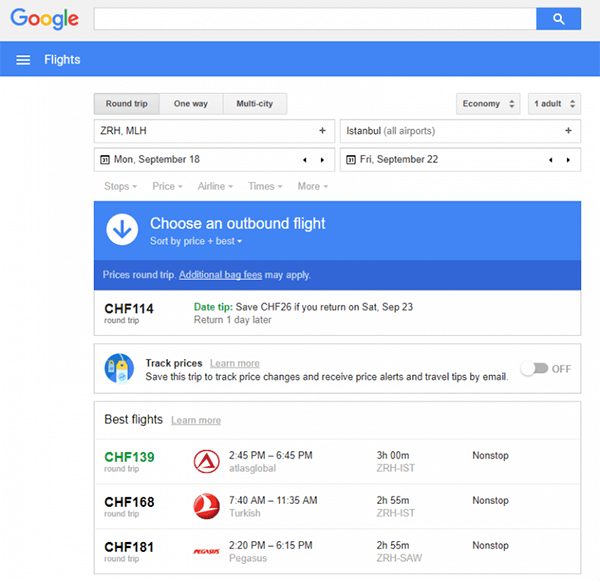 Just choose your starting airport and the dates and Google Flights will automatically show you a cool selection of possible destinations to go to. Usually with pretty affordable prices. Be careful, you will get addicted to that feature pretty fast! If you like this kind of searching a flight I can also highly recommend Kiwi – which is exactly the same principle. In comparison to Google Flights, you can even include low-cost airlines like EasyJet or RyanAir to your search, which is quite useful sometimes. I used Kiwi almost every week to look for great offers. Other tricks to find cheap flights? There are three more things I want to mention. 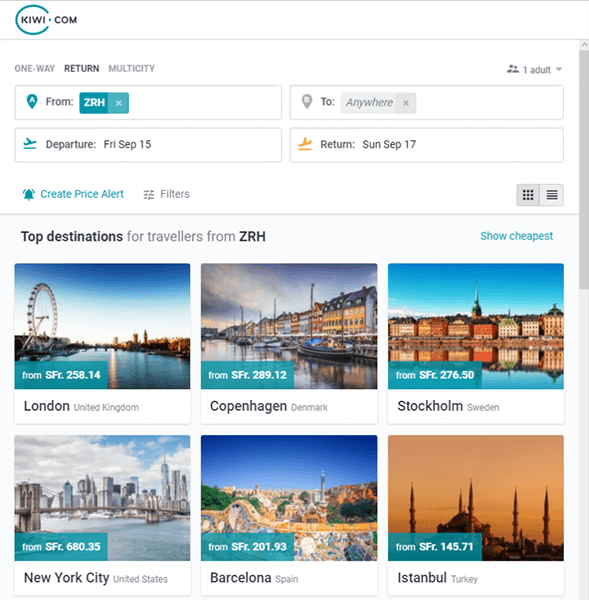 Firstly most comparison pages, also Google Flights, don’t show the low-cost airlines – so if you want to compare them as well, check their prices on their page. But be careful: Most of the time they will fly to airports, that are located outside of the city, which will force you to pay for public transport or even taxi to reach the destination. Secondly, there are some exceptions in searching tickets: Special holidays, big sports events or other special events will always lead to higher ticket prices. If that is the case: Book as early as possible to not get a bad surprise at the end. Finally, watch out for the luggage you can take with you. With cheap fares, you are usually only allowed to bring a hand luggage, which can be quite problematic, especially if you are traveling with photography gear or you plan to buy a lot of stuff while traveling. If you are looking for more tips to save money while traveling you can check out these 10 tips. Now you got your ticket and you can just hope to not sit next to some annoying passengers on the plane.